Volunteers Tommy Baker and Felicia Sanders help dish up hot fare for shelter clients. 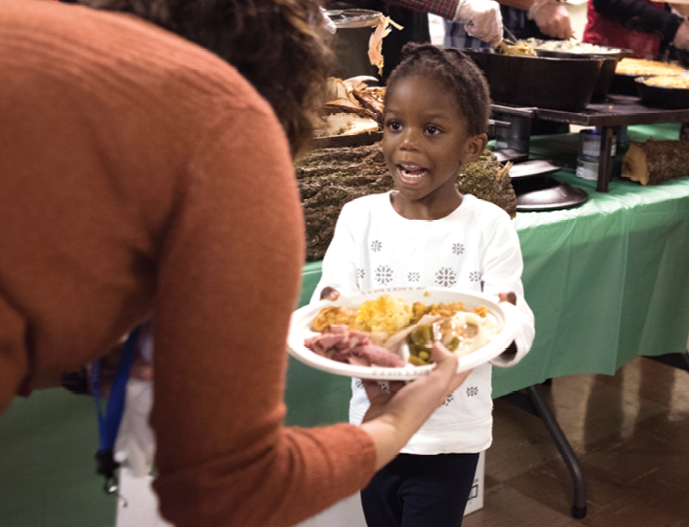 A young girl accepts a plate loaded up by Feed the Need. Want to lend a hand? Contact Bakst at mickey.bakst@belmond.com. The gentleman stood in line, patiently waiting for his hot meal, unaware that a concerned neighbor from his comfortable Mount Pleasant subdivision was helping with the service that day. “When I saw this man, who lives just down the street from me, taking lunch at a shelter, I realized this is not about being homeless,” says Mickey Bakst, who launched the nonprofit Charleston Chefs Feed the Need in 2009. “This is about great human beings who work hard but still struggle to put food on the table, about people having to choose between paying their mortgage and feeding their kids.” The encounter made him even more determined to bring together food industry pros and area shelters like One80 Place, Tricounty Family Ministries, and The Neighborhood House. Since its beginning, Feed the Need’s primary mission has been to recruit restaurants, hotels, and grocery stores to bring provisions and people to the table so that soup kitchens can continue to plate meals. The charity booked 46 businesses last year (from The Indigo Road to Whole Foods to Belmond Charleston Place) to prepare and serve some 80 family-style meals for an average of 400 diners each week. “But feeding the hungry isn’t enough,” says the Charleston Grill general manager. “We need to support those helping the needy feed themselves.” Inspired by the on-the-ground push of local organizations to break people out of poverty, Bakst has begun tapping fellow F&Bers to cook up Feed the Need fundraisers. 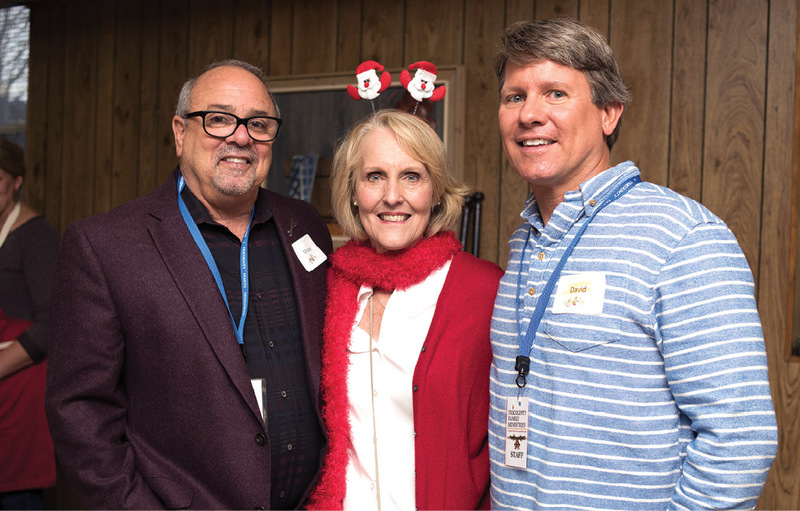 Last fall, for example, The Indigo Road hosted a “Dining for the Cause” benefit at the Cigar Factory that raised $300,000. These donations fuel the shelters’ efforts to provide clients with housing, medical, dental, legal, and financial aid. The growing nonprofit has also welcomed a couple of newcomers to the table, expanding to two more cities, including Bakst’s hometown, Detroit. “When I was 10, my parents took me to the rougher areas of the city to show me that there were people who had less than us,” he recalls. 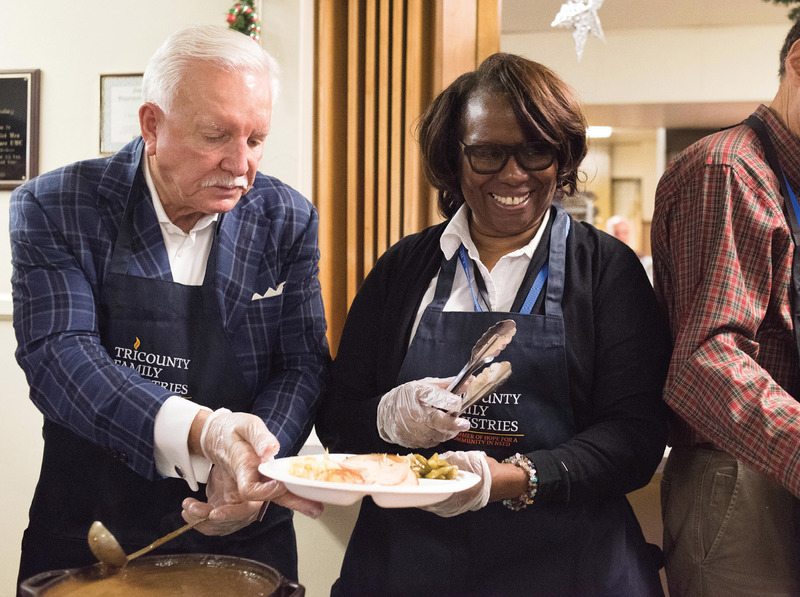 Fifty years later, on one of the same downtown corners he visited, Bakst and company fired up Detroit Area Chefs Feed the Need with hot meals for 1,000 people. Since then, hospitality professionals in New Orleans have also launched a chapter with Bakst’s guidance, an expansion he hopes will continue to other U.S. cities.